Hyderabadi Bharwa Baingan, also known as Baghare Baingan is one of the first recipes I learnt after getting married. In the beginning I found it very tedious to cook this dish – after all is just a vegetable. But then Baingan is no ordinary vegetable and Bharwa Baingan is so delicious, so I continue to make it atleast once a month. The use of aromatic spices like coriander, poppy seeds, dried coconut and groundnuts combined with cumin and fenugreek seeds impart a very rich flavour to the dish. The Hyderabadi cuisine has evolved over centuries. A mixture of Northern and Southern way of cooking, the recipes began to take shape during the medieval times by the khansamas (chefs) that served the Deccan Nobility (The Nizams). Since the city of Hyderabad was the seat of the rulers, the cuisine came to be known as Hyderbadi Cuisine or Nizami Cuisine. The cooking technique developed over a period of time gave form to the modern Hyderabadi cuisine. Hyderabadi cuisine (native:Hyderabadi Ghizaayat) also known as Deccani cuisine of India, was developed after the foundation of Qutb shahi dynasty by Sultan Quli, promoting the native cuisine along with their own. Hyderabadi cuisine had become a princely legacy of the Nizams of Hyderabad State. It is an amalgamation of Mughlai, Turkish and Arabic along with the influence of the native Telugu and Marathwada cuisines. Hyderabadi cuisine comprises a broad repertoire of rice, wheat and meat dishes and the skilled use of various spices, herbs and natural edibles. The cuisine emphasises the use of ingredients that are carefully chosen and cooked to the right degree and time. Utmost attention is given to picking the right kind of spices, meat, and rice. Therefore, an addition of a certain herb, spice, condiment, or a combination of these adds a distinct taste and aroma. The key flavours are of coconut, tamarind, peanuts and sesame seeds which are extensively used in many dishes. 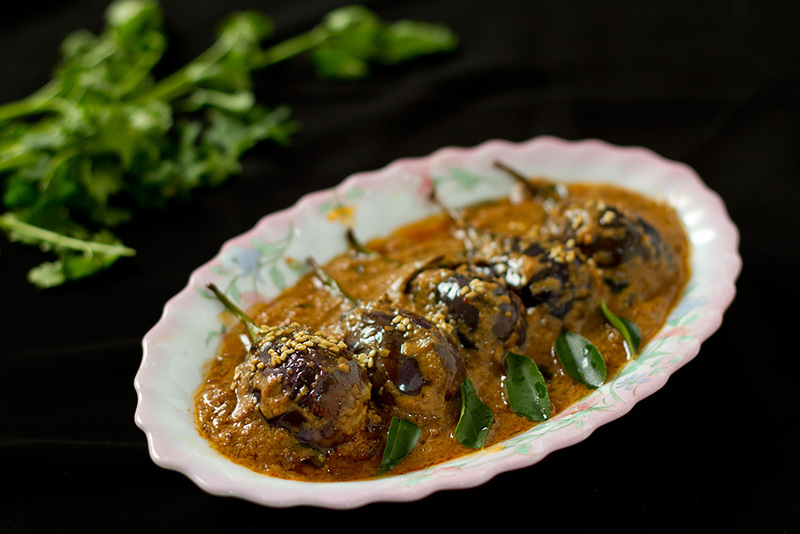 The key difference from the North Indian cuisine is the use of dry coconut and tamarind in its cuisine. In pan dry Roast coriander seeds , sesame seeds, groundnuts dried red chilie, and poppy seeds. Add dry coconut to the roasted ingredients. A lovely aroma of the roasted spices and coconut will fill your kitchen. Let the spices cool down and ground them into a fine paste. Heat half the oil in a pan and add cumin and fenugreek seeds followed by onions, ginger and garlic. Fry well so that all the raw smells disappear. Add turmeric, the dry roasted and powdered masala and fry for a few seconds. Add the tamarind juice, jaggery and salt. Fry till oil surfaces and switch off the stove. Let the masala cool down and run it through the grinder once again. Add some water if needed. The masala should be fine paste now. Stuff each aubergine with the masala. It takes less than a tea spoon for one aubergine, so you will have plenty of masala left over for the gravy. In a clean pan, heat the remaining oil, sputter some sesame seeds and curry leaves. Stir for a few seconds, and drop the stuffed aubergines. Shallow fry the aubergines for a couple of minutes, then cover them for another couple of minutes, keep stirring so that the masala and vegetable do not stick to the bottom of the pan. Add the remaining masala to the pan and let Aubergines cook till they are tender in this masala mixture. This will take about 8-10 minutes. Keep sprinkling water if necessary. When the Aubergines are tender, and masala well fried along with it, some oil will surface. Serve hot immediately after cooking. This Hyderabadi style bharwa baingan goes best with hot rotis and steamed rice with a dollop of ghee. Thank you. It is in the step 3.